Remember how things were bigger when we were younger? How the El Niños of our youth just seemed to produce more rain in California? How come so many El Niños of late have been La Nadas for rain? It turns out that, like many things, the El Niños index has changed. The NOAA Climate.gov El Niño blog explains Why are there so many ENSO indexes, instead of just one? If you want to go deeper, read NCAR's Climate Data Guide entry about NINO SST INDICES (NINO 1+2, 3, 3.4, 4; ONI AND TNI). The short answer is that the original El Niño index was based on the eastern Pacific areas where the effect was first noticed and named. You may have grown up hearing TV weathercasters talking about El Niño index 2 or 3 (depending on your age.) Today, they are probably talking about El Niño index 3.4. 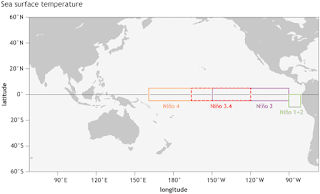 Boxes denote various regions used to calculate El Niño indices. The eastern Pacific ones (1-3) are closer to California and have a bigger impact on our rainfall patterns. 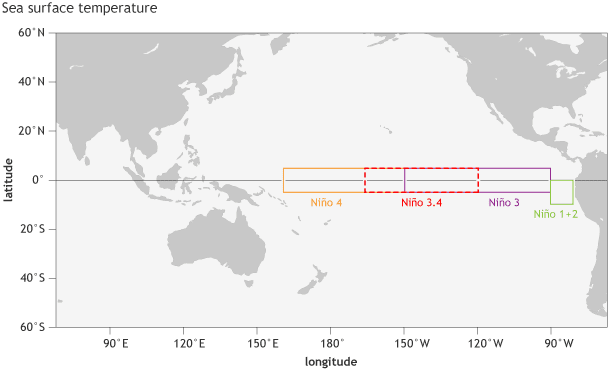 The western Pacific El Niño index is a better predictor of monsoon patterns in Asia. El Niño index 3.4 gives the best overall diagnostic for global weather changes. It looks like we could have a mild El Niño in California this season. I'm cautiously optimistic for a wetter than normal winter. That may just be wishful thinking on the part of this gardener as El Niño 3 is meandering up and down in recent months. My poor shrubs could use a good soaking to dilute the salts that have been building up from irrigation with hard water instead of rainfall. Keep in mind that these indices are based on deviation from a departure from a 30-year mean. The entire planet, including the oceans, has warmed in recent decades. The temperature and pressure gradients (contrast between different areas) determine storm tracks. But, the warmer oceans and air masses mean that storms contain more water, about 7% more water on average. Storms are also sticking around longer due to changes in the jet stream (probably related to the melting polar ice.) Some models suggest storms will generate 50% more rainfall in places where they land! So, for those of us in California, rainfall will be more rare but more intense. We need to re-engineer our cities for the new reality. That's going to take money and cooperation because it is in everyone's best interest. Are you with me?